Last weekend, Mommy Jane brought Little Angels to 1 Utama Shopping Centre to attend Dutch Lady Junior NBA programme. Since my Little Angels are having a basketball training every weekend by EPS Sports Academy at Desa Parkcity, they love the game so much and Mommy Jane brought them here to understand and explore more on the game. The three-day event where NBA fans and basketball enthusiats were treated to authentic NBA entertainment featuring Harry the Hawk's jaw-dropping dunks, acrobatic skills and hilarious antics that got the crowd cheering while the 6"9" Charlotte Hornets' veteran forward, Marvin Williams interacted with the Malaysia fans. 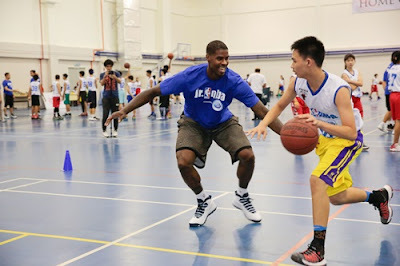 Top 30 boys and 33 girls who had participated in the Jr. NBA Malaysia National Training Camp at IGB International School trained under Marvin Williams and Jr. NBA Coaches Chris Summer and Natalia Andre to learn the fundamentals of basketball and compete in scrimmages. Outstanding 16 players were crowned by YB Dato' P. Kalamanathan, Deputy Minister 1, Ministry Education, YBrs. Dr Mehander Singh A/L Nahar Singh, Director of Sports Division, Ministry of Education; Jim Wong, Associate Vice President of Global Marketing Partnership at NBA Asia; Marvin WIlliams, the forward from the Charlotte Hornets, Chris Summer, Jr. NBA Coach, Saw Chooi Lee, Managing Director of Dutch Lady and Ashlee Ng, Marketing DIrector of Dutch Lady. Group photo with YB Dato P. Kamalanathan, Deputy Minister 1, Ministry of Education; YBrs. Dr. Mehander Singh A/L Nahar Singh, Director of Sports Division, Ministry of Education; Jim Wong, Associate Vice President of Global Marketing Partnerships at NBA Asia; Saw Chooi Lee, Managing Director of Dutch Lady; Ashlee Ng, Marketing Director of Dutch Lady; Marvin Williams from the Charlotte Hornets; Atlanta Hawks mascot, Harry the Hawk; with their partners Sim Sin Heng, Deputy Secretary General of MABA; Choong Khay Lee, Vice President of Sports at Astro; Glenny J Da Coasta, Senior Sales and Marketing Manager at Spalding; Ken Han of the KL Dragons and all 2017 Jr. NBA Malaysia All-Stars. The 16 outstanding players will travel to Shanghai with fellow Jr. NBA ALL-Stars from Indonesia, Philipines, Singapore, Thailand and Vietnam to watch the NBA Global Games 2017 featuring the reigning NBA Champions Golden State Warriors and the Minnesota Timberwolves. 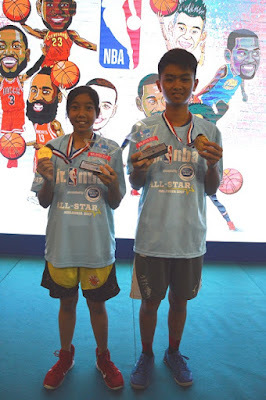 Khalidah Naim bt Kamaludin (female MVP) and Yap Jin CHeng (male MVP) were all smiles after being named the female and male Most Valuable Players respectively at the Jr. NBA Malaysia Training Camp. Sportsmanship, teamwork, a positive attitude and respect were instilled within the participants to ensure that they become holistic players after experiencing the programme. As part of the Dutch Lady's Drink. Move. Be Strong campaign, 2 glasses of milk per day for sufficient calcium and protein. Marvin Williams said that our Malaysian youth show a lot of eagerness to learn the game of basketball and he expect these athletes to continue working on their craft and participating in basketball programmes like the Jr. NBA and maximise their potential as individuals on and off the court. Fans can follow Jr. NBA on facebook at www.facebook.com/jrnbamalaysia for more information and to check on how their All-Stars are doing among their regional counterparts. NBA website at www.nba.com and be friend at the NBA's official account on LINE by adding @nba_global. My Little Angels enjoyed playing the basketball game at the Astro booth. They played at the PS4 game machine and the Virtual Apps to claim for a small gift. They were happy able to see their idol, Marvin Williams in person and saw Hawk in action. They learned some tactics to master the game well too. Hopefully for next year Jr NBA, my Little Angels will be selected amongst the top player but right now, Mommy Jane just want them to enjoy the game instead. Shini, you can encourage children at your family to join it too. Rane, you should start them now. Miera, we need to instil the interest in them. Racheal, it is indeed fun. Awww. JUNIOR NBA programme? Just the perfexr programme for kids to build up their athletics skills.